2016 Sundance Film Festival, U.S. Documentary Special Jury Award for Social ImpactFilmmaking, official selection 2016 Athena Women’s Film Festival, and officialselection 2016 Stranger than Fiction Documentary Series. What remains of a women’s right to choose? Targeted Regulation of Abortion Providers (TRAP) laws are increasingly being passed by states that maintain they insure women’s health. But as clinics are forced to shut their doors, supporters of abortion rights believe the real purpose of these laws is to outlaw abortion. Since 2010, 288 laws regulating abortion providers have been passed by state legislatures. In total, 44 states and the District of Columbia have measures subjecting abortion providers to legal restrictions not imposed on other medical professionals. Unable to comply with these far-reaching and medically unnecessary laws, clinics have taken their fight to the courts. 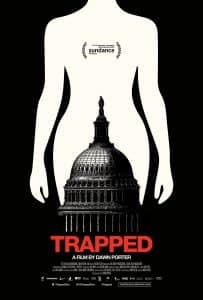 As the U.S. Supreme Court decides in 2016 whether individual states may essentially outlaw abortion (Whole Woman’s Health v. Hellerstedt), Trapped follows clinic workers and lawyers who are on the front lines of the battle to keep abortion safe and legal for millions of American women, where most clinics are in a desperate battle for survival.